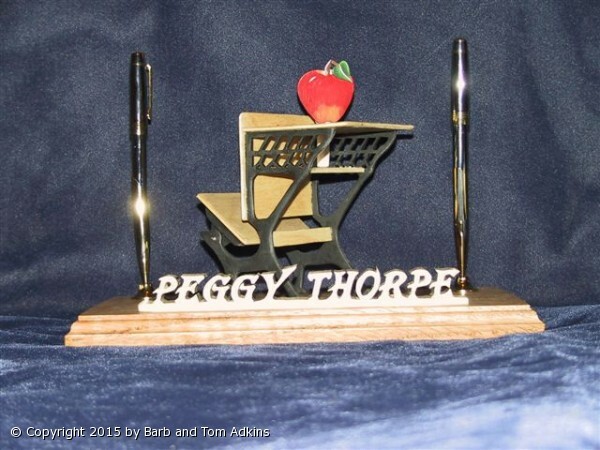 This is a minature replica of an orginal Peabody Desk. It was important to Tom to make the seat moveable just like the one he used as a child. The apple can be removed and becomes a wearable piece of jewelry. Tom had to create his own pattern for each of the individual piece, using the old Peabody School desk we had in the house for size and design. The little side sections of the desk have been carefully hand cut with a scroll saw. Each section is cut separately by stopping the saw and taking the saw blade out of the saw and inserting the blade into a new area of the wood. A tiny hole must be drilled into that individual section of the wood first, then the blade can be inserted into that hole to start the cutting of that area or section of the piece. After all the cutting is done each area must have all the edges carefully hand sanded and rounded. The pencil is hand made and fits the pencil slot cut into the top of the desk. The person's name can be custom ordered for each deskset. A Custom Designed Font is used for each name. This can be custom ordered with or without the pen set. This is a wonderful desk for teachers.